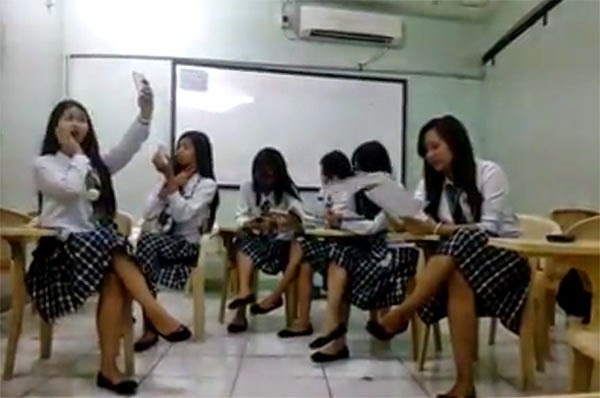 A funny video showing female college students performing a "hair dance" inside the classroom in a Pampanga school has gone viral on Facebook. The video was uploaded by Facebook user Jhoi Salac on October 3. It has already garnered over 266,000 views, 4,000 likes and more than 5,000 shares as of this posting. In it, six students of St. Nicolas College of Business & Technology in San Fernando are seen pretending to be busy doing something. Four of them dance to the tune of Meghan Trainor's "All About That Bass" alternately until a surprising yet funny moment happens. Had not the minor accident occured, the students would have completed their own version of the "hair dance," a dance craze popularized by TV host and comedian Vice Ganda last September. But thanks to such "epic fail," the cute BSBA students have gotten famous on social media.